MainAll NewsForeign AffairsWill Brazil be latest country to move embassy to Jerusalem? Will Brazil be latest country to move embassy to Jerusalem? Brazil's president-elect vowed to move embassy to J'lem. Now, confidant says he will consider move - if it will promote Mideast peace. Nearly three months ago, Rio de Janeiro federal deputy Jair Bolsonaro vowed that if elected president in this year’s Brazilian presidential election, he would move his country’s embassy in Israel from Tel Aviv to Jerusalem. The head of the right-wing Social Liberal Party added further to his pro-Israel bona fides when he suggested that the Palestinian Authority’s office – which serves as a de facto embassy – be closed in the capital city of Brasilia. “Is Palestine a country? Palestine is not a country, so there should be no embassy here,” Bolsonaro said. While his statements regarding both the Brazilian embassy in Israel and the PA facility in Brasilia appeared definitive before the election, sources close to Bolsonaro suggest that after winning the presidential race, the 63-year-old former Brazilian army captain is not yet settled on the matter. 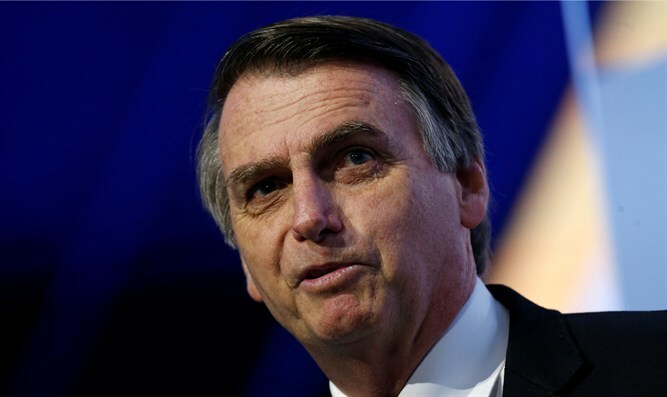 According to a report by Kan, a confidant of the Brazilian president-elect said Bolsonaro wants to move the embassy in Israel to Jerusalem, as he promised during his campaign, but added that the issue would first be examined carefully, to see whether such a move would promote peace in the region. “Will it promote peace in the Middle East?” the source asked, saying that the answer would be an important factor Bolsonaro’s final decision in the matter. Bolsonaro was elected Sunday, defeating Workers’ Party candidate Fernando Haddad, the former mayor of Sao Paulo, by a ten-point margin, 55% to 45%. Sunday’s vote was the second round in the country’s presidential election, after Bolsonaro won the first round on October 7th, but failed to win the 50% necessary for an outright victory.